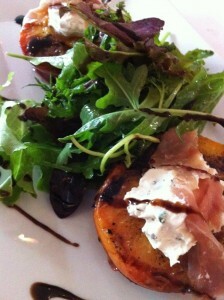 Chilled Grilled Peach Salad with Baby Arugula. Wow, doesn’t that sound refreshing on a hot summer’s day? 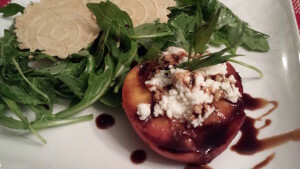 Think about a juicy grilled peach that’s been chilled and filled with creamy herbed cheese and drizzled with a sweet and savory balsamic vinegar syrup and served alongside a baby arugula salad tossed with a citrus-herb-vinaigrette and sprinkled with crispy bacon bits. That was certainly a mouthful! Sweet and succulent and savory and smoky and crunchy all together on one plate! This salad’s inspiration began at Patsy’s Restaurant in Bethany Beach, Delaware. Patsy’s is a favorite food spot when we are visiting the Delaware Beaches. 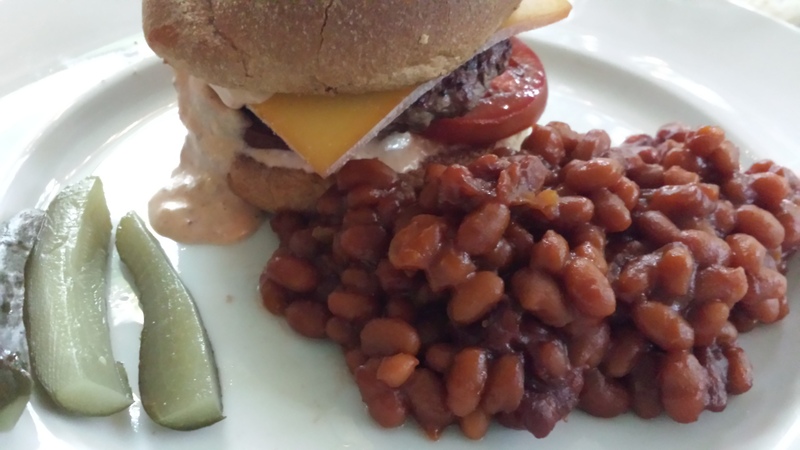 Check out my posting about Patsy’s here: Patsy’s Restaurant in Bethany — Key West Seduction at the Delaware Shore. 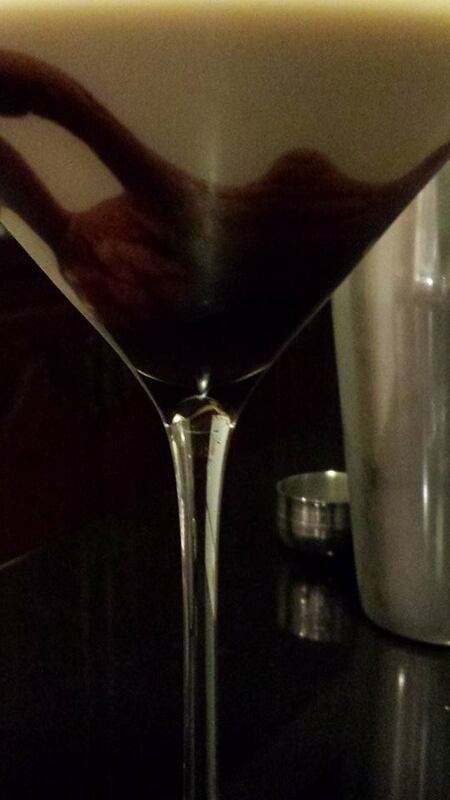 Here’s my version which in no way outdoes the original, but it hits the spot when I can’t get to Patsy’s for the real thing. 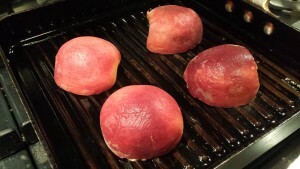 Just halve and grill some ripe peaches in a grill pan with some coconut oil until the grill marks have set, just a few minutes. Chill the peaches for a few hours or overnight. When ready to plate the salad, divide the chilled grilled peach halves amongst four plates. 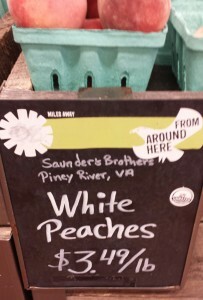 Mix together some herbed Boursin cheese and some goat cheese and fill the peach centers with a dollop. 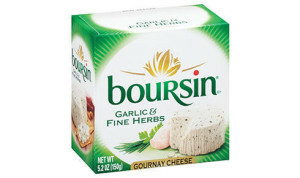 You can use Boursin or another herbed cheese. Then whisk together a citrusy vinaigrette of olive oil, lemon juice, orange blossom honey balsamic vinegar, chopped fresh herbs, and honey. Season to taste with salt and pepper. Toss the baby arugula in the vinaigrette and divide amongst the plates. 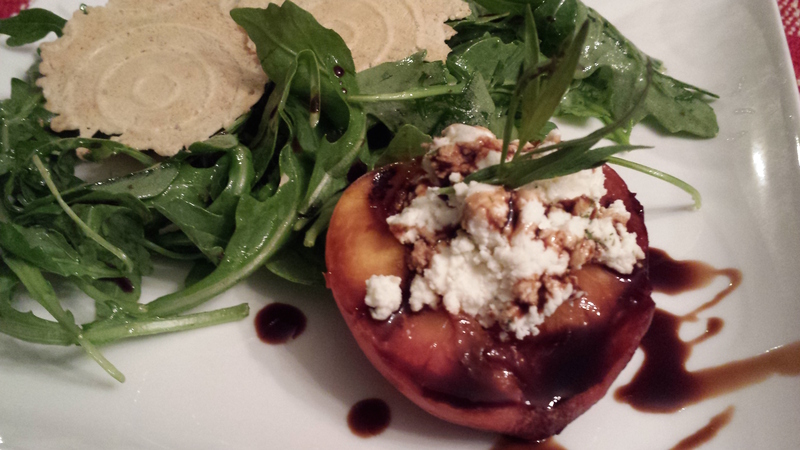 Drizzle some balsamic vinegar syrup over the peaches and the baby arugula. Then sprinkle some crispy bacon crumbles over the baby arugula. 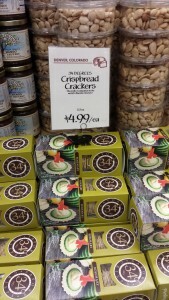 Add some of your favorite salad crackers or a slice of buttered baguette and you’re ready to serve! 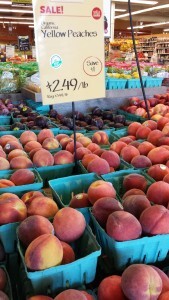 Be sure to use ripe juicy peaches that are in season. Try to buy local, if possible. I like 34 Degrees crackers because they are thin, light, and crispy. Look for them at your local grocery store. 1. Heat a grill pan over medium heat on your stove. 2. 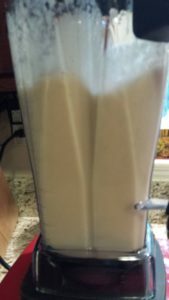 Melt the coconut oil into the grill pan or lightly coat the pan with cooking spray, being sure to coat the raised grooves. 3. 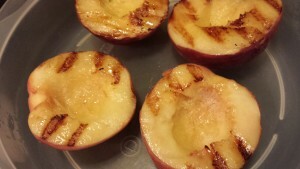 When the pan has heated, but the oil is not smoking, place each peach cut-side down on the grill to make nice brown grill marks and cook just for about 2 – 3 minutes. 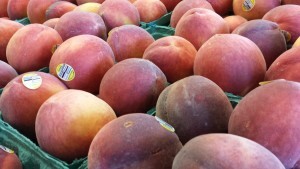 Be careful not to burn the peaches — you just want grill marks. 4. With a spatula, carefully remove the peach halves to a container after their grill marks are set. 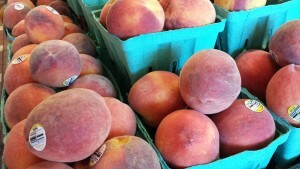 Cover the container and chill the peaches for a few hours or overnight. 5. When you are ready to assemble the salad, mix together the Boursin cheese and the goat cheese in a small bowl until well-combined. 6. Place a chilled grilled peach half on each of your four serving plates. 7. 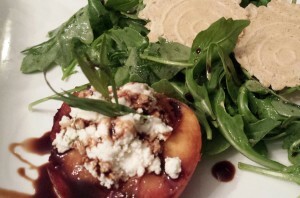 Put a dollop of the Boursin goat cheese mixture into the indentation of each peach half. 8. Now, make the vinaigrette. In a non-metallic bowl, whisk together the olive oil, vinegar, lemon juice, herbs, and honey. Season with a bit of salt and pepper. 9. In larger bowl, toss the arugula with the citrus vinaigrette. 10. Divide the dressed arugula amongst the serving plates. 11. 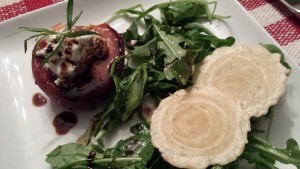 Drizzle the balsamic vinegar syrup over the filled peach halves and the baby arugula. 12. Sprinkle the crumbled bacon over the baby arugula. 13. Put an herb sprig in the Boursin goat cheese dollop for garnish. 14. Add the salad crackers to the plates, and serve! Makes 4 salads. If making for two diners, you could easily offer two peach halves per plate and some additional arugula for a “main course” salad. Variations: Use mixed baby greens instead of arugula. 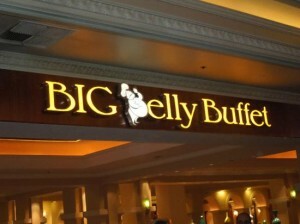 Try bleu cheese instead of the Boursin. 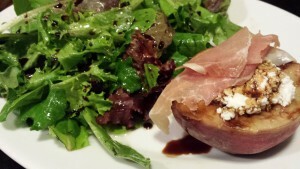 Use prosciutto instead of bacon just like the original at Patsy’s Restaurant.